It has been exactly one year since my last posting regarding this ongoing skin rash called Grover’s. The rash began to bother me in around October, 2011. So it has been almost 2 years that I have been coping, or more accurately, fighting with it. The good news is that it has now been one year that I have learned to control all itching even though the rash is still present. If you can control the itching, then having some minor red patches on the skin is not a problem. 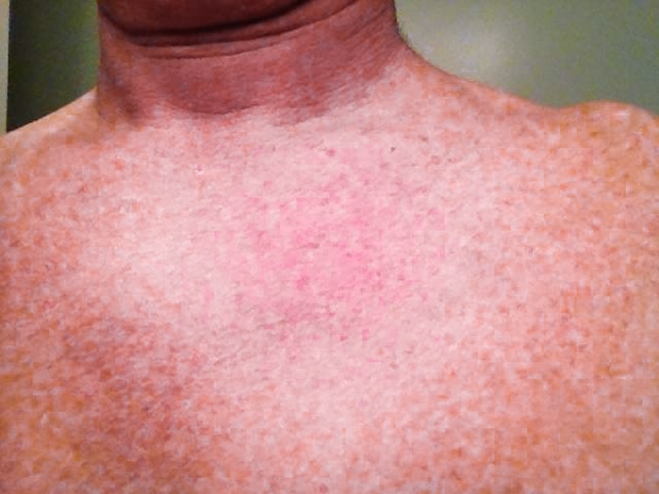 The photos below show the present state of the rash as of August, 2013 that is centered on the upper chest area. The exposure of the photo was increased slightly during editing to cause the redness to be more visible. The little brown spots that appear throughout the picture are freckles from the sun, and are not part of the Grover’s rash. The photo below was taken in July 2012 of the same area of the upper chest. Comparing the photos, the rash has been reduced in severity though it is still present. I estimate that the amount and size of little red bumps are now 33% of what they were a year ago. During the first year, I tried every possible remedy that you could imagine to treat this rash, over-the-counter medicines, anti-fungals, prescription medications from my dermatologist, and a variety of creams & ointments designed to reduce the level of sensitivity of the skin, and therefore the itching. It had gotten so bad that in March 2012 I even tried a Chinese herb doctor who prescribed and sent to me packets of dried herbs that smelled like something that could might have been scraped off the floor of a barn. Nothing worked. Grover’s is still considered a “disease” or rash without a cure. It is the result of a breakdown of the tissue between the skin cells that line the upper chest and lower part of the rib cage. There is no infection, germ, or known cause of this rash. There is also no known treatment. Since this is not a life-threatening problem, there is also no research being done to try and develop a cure. All that your skin doctor will be able to do for you is to try prescribe some ointment or pill that may reduce the symptoms (itching) without treating the problem (breakdown of the skin). The only thing that helped during the early months of this disease to control the itching was to take repeated hot showers throughout the day and night. I had learned this trick during one of my trips to the tropics many years ago to go diving. After being bitten by sand fleas or mosquitoes, you deaden the skin’s sensitivity to the toxins these insects inject into your skin for a few hours with a 5-minute shower using very hot water. For six months, between January and June 2012, I would waken every 1 to 2 hours at night and have to take a quick hot shower in order to be able to go have some temporary relief from the itching and be able to fall back to sleep. Basically, this was a period of sleep deprivation. During my random experiments in 2012 of applying almost every powder and cream to the itching skin, I discovered that it was the Seaweed powder that caused the itching to mostly disappear. From the very beginning, this allowed me to get 6 hours of relief which was sufficient for my average night’s sleep. It has now been one year since I have been using only the seaweed (Seagate’s own product) to treat the itching. I do this twice a day, in the morning when I wake up and at night before going to sleep. This is sufficient to keep me free from itching for the complete 24-hour cycle of the day. 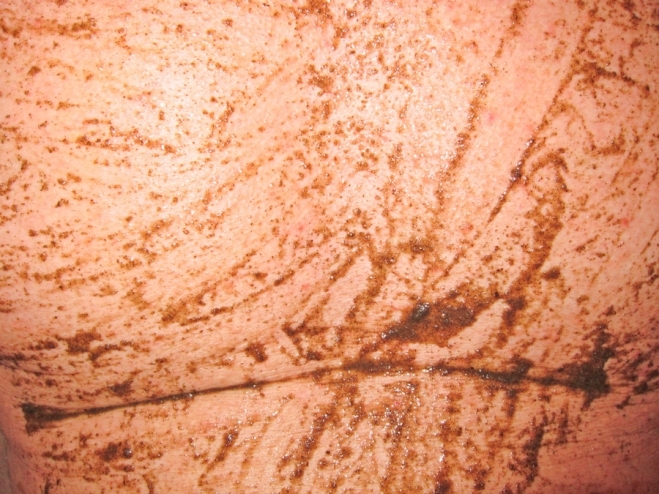 The method is: 1) take a quick hot shower; 2) use soap to wash down the entire body with special attention to the areas of the rash, and rinse off; 3) pour a small amount of powder into your hand and gently rub it onto the wet skin that has the rash – the powder will immediately turn into a paste; 4) after a minute the paste will dry and you can add a little more water to it again and continue to rub it into the rash; 5) rinse off all the seaweed paste with hot water. As the seaweed is being rinsed off, the affected areas of skin will sting for a few moments. My dermatologist and I have different theories about why the seaweed might be helping. It could be the high salt content that has dried into the powder from the seawater that is soothing to the skin. However, I have tried applying sea salt in place of the seaweed in the shower and have only caused further irritation of the sores. Another theory is that the high iodine content in the seaweed has some therapeutic effect. Possibly just having a brief seaweed wrap, like they do at health spas, is giving some beneficial effect. I believe that it is probably a combination of all of these above factors that are contributing. The rash has been receding and the size of the red bumps diminishing. Probably some of this is a result of me no longer having to scratch my skin and some of this effect is caused by the seaweed actually having some sort of therapeutic effect at stopping the itching and reducing the rash. Emanuel - Glad you found a remedy. Waking up every one to two hours sounds like a death sentence. How would one cope with work? I have heard benefits of algae before like spirulina and blue-green algae. Kat Braza - What else can seaweed be used for when it comes to health? I know they’re a big food product in sushi. I’ve also bought seaweed “chips” before at the store – basically dried seaweed that is like a chip and can be eaten. sarahluvzveggies - it’s always good to have a remedy on hand for itchy skin. you might think it’s not a big deal now but when you have a rash you’ll be screaming for something to make it stop. trust me, i’ve been there -_- too bad for this guy it’s a constant thing. glad the seaweed worked. Richard (Founder) - Kat – Seaweed can help with a number of things including your thyroid. Keb - Try using Magnesium gel -it works on poison Ivy rash. Noni juice works like the seaweed powder , it is used for diabetic ulcers. Hi Kat – Seaweed can also be sprinkled on your salads, soups, pastas, omelets, chowders, cooked vegetables, or into juices and smoothies. Seaweed powder can also be mixed with a small amount of water to make a paste and applied to the face for its complex of sea salts, minerals, and protein to help soften the skin.